Now that the countdown to our Pacific Northwest trip has gone from months to just a few weeks, our planning is much more organized in the form of a Google Doc, which is further divided into essentially a list of foods, drinks, and sweets and another list of "everything else" - a scattered assortment of sights, markets, museums, and parks we hope to see. I AM PUMPED. It will inevitably be a feast for our eyes and our bellies. And our spirits. One thing that Andrew has become very into lately is coffee, as evidenced by our recent purchases including an aeropress and a bialetti moka pot. We've been living off Keurig coffee these past three years, mostly due to convenience and laziness. It's fast, but the taste is to be desired, not to mention its poor environmental impact. So in an effort to improve both our earth and our general coffee experience, we are going to try and make moves towards different coffee methods. Fingers crossed - we love experimenting with new kitchen tools and techniques but also reserve the right to trump any new methods if deemed unpractical, since we'll be interns next year and time will be, as always, precious. But if you have any suggestions, let me know! Along the lines of practicality, I've been cooling off my layer cake obsession last year and turning to recipes that are much more realistic for the every day student - ones that take minimal effort, make as little mess as possible, and still taste damn good. Treats that go well with your cup of coffee in the morning or something to share with friends in class. Sara Cornelius' ultimate chocolate chip cookies have been a game changer lately, along with that lemon loaf from last month and Molly Yeh's sesame coffee cake. Don't get me wrong, I love a good layer cake and I'll be a frosting girl forever and ever (I think), but lately there's something quite satisfying in a naked slice of loaf cake or a salty-sweet cookie. So along the lines of practicality, here's another unfrosted dessert that you can whip up on a weekday and take to class without feeling too flashy. And keeping in spirit with the weather, it's the perfect spring-into-summer dessert, with strawberries to embrace the spring and buttery dough reminiscent of summer fruit pies. This weekend one of my favorite couples, Ben and Erb, are hosting a crawfish boil along with their great friends Mike and Keelee. I typically contribute sweet things to a party, and this year will be no exception (although ironically, after saying I've cooled down on layer cakes, I'll be bringing cake to this party har har. There's a good reason though, promise). 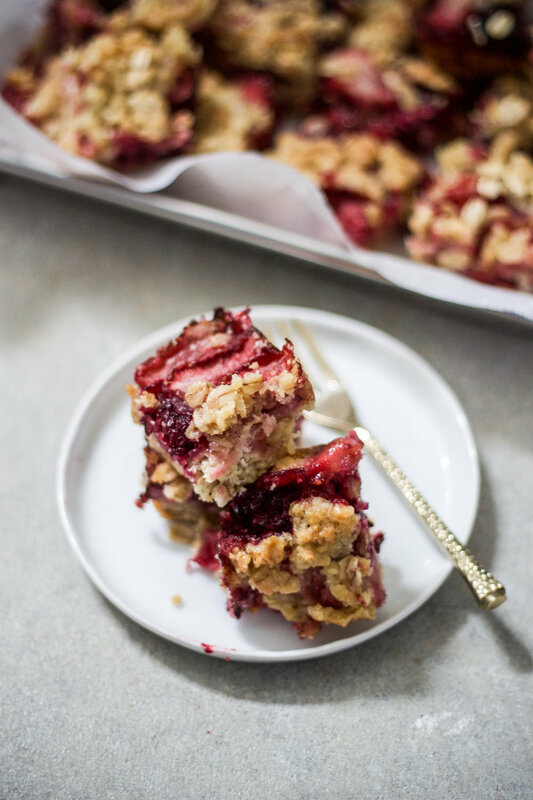 These buttery, jammy bars would be the type of thing that works well in these potluck situations, where each person can just grab a square and move quickly onto the next item so you're not holding up the line. They're not too fiddly and easy to eat, small enough for you to get a taste of everything else, because who wants just one dessert at a potluck, right? Happy almost Friyay! Enjoy the rest of your week, friends. Preheat oven to 375 F. Grease and line an 8x8 pan with parchment paper, then set aside. In a large bowl, mix the blackberries, strawberries, 2 tablespoons of sugar, and cornstarch until combined, then set aside. In another large bowl, combine the flour, oats, baking powder, and salt. Add the cold butter and, using your fingers, press the butter into the flour mixture so that it becomes like small crumbs/pebbles of butter within the flour mixture (much like you would do with pie dough). Add the egg and vanilla extract and, using a wooden spoon, mix until it forms together into a dough like wet sand. Spread 2/3 of the dough mixture into the pan, then add the berries. Top with dots of the dough mixture (it won't be able to cover all the berries, and this is ok). Sprinkle on top more old fashioned oats and turbinado sugar, then place in the oven and bake for 40-45 minutes, until the top is golden brown and the juices from the berries starts to subside a little.